UFS Desktop Bulk SMS and Number Extractor software is a desktop application that helps you to send customized and personalized SMS to your contacts through the internet. It also helps you to extract and manage phone numbers and email addresses from urls and texts inputs. UFUMES SMS and GSM Number Extractor App. UFS App runs on Windows XP, Windows 7, Windows 8. It may run on older versions of windows OS, but it has not been tested on them. UFS App requires that Microsoft Office package is installed on the computer it would be used on. UFS App requires good internet connection in order to send Bulk SMS and Extract Web Contents or make use of extraction credit. UFS App features five (5) major utilities which includes the "Send Bulk SMS", "Phone Contact Manager", "Extract Numbers and Emails", "Extract Web Contents" and "Text Data Editor" Tabs. The "Send Bulk SMS" tab allows you to send customized Bulk SMS to your contacts across the internet. Here, you can compose your text messages, save drafts, specify your intended recipients, specified desired sender IDs, View or delete sent messages, and send Bulk SMS to your desired recipients. Read More? The "Phone Contact Manager" tab allows you to Add, View, Edit and delete contacts from your list of contacts stored within the software. You can create individual or group contacts. You can import contacts directly from Nokia csv files, techno csv, vcards (.vcf) , name-number pairs and other formats. You can export your contacts to several formats like Vcard, Nokia csv etc. Read More? The "Extract Numbers and Emails" tab helps you to extract phone numbers and email addresses from texts. It consists of 7 subtabs that helps you to accomplish several GSM number management functions such as Phone Number Extractor, Phone Number Generator, Phone Number grouper, Phone Number Reformater (country code editor), Unwanted number removal, and Email extractor. Read More? The "Extract Web Contents" tab is a semi web crawler that visits the lists of specified urls or searches the search engines for specified search term. It extracts all the numbers, emails and url that it finds on the visited web pages. Read More? The "Text Data Editor" tab allows you to reformat your text data. 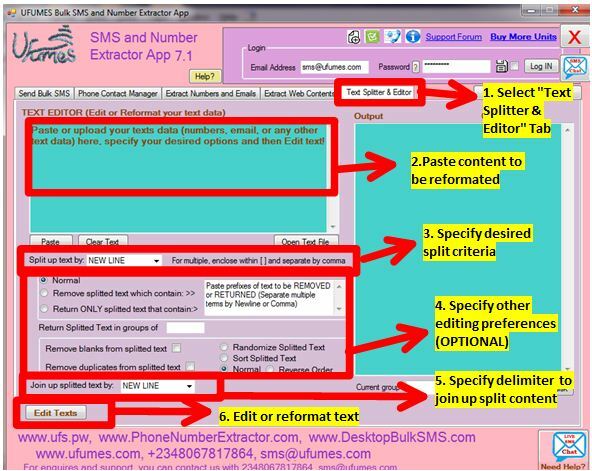 It allows you to split up text data by desired separator. You may return or remove splitted data that starts with specified prefixes. You may remove blanks from splitted data, you may group splitted data into desired group sizes, you may remove duplicates, sort, randomize or reverse the order of splitted data. The splitted data can then be joined up again with desired separator. Read More? Download and install UFS App. The software prompts you to create an account. Use the activation code sent to your registered number to activate the trial version of UFS App. The trial version which opens up is preloaded with some free SMS and extraction units that helps you to preview the full functionality of the software. Log into your account with the details you registered with. Click on "save Login Details". In the "Send Bulk SMS" tab, specify and save default sender's ID and Owner's GSM (Lower right corner of the tab). You may then proceed to sending SMS or other performing other tasks. Sending SMS requires that you have enough SMS credit units to send to your desired recepients while extraction of number or other utility tasks requires that you have an active subscription using your free trial extraction credits. You may purchase additional SMS credit or extraction units when you have exhuasted the free trial units. Sending SMS with UFS Desktop Bulk SMS software provides a very cheap way to reach out to your individual or group contacts simultaneously through personalized and customized Bulk SMS. It is excellent for sending personal text messages, business promotions, reminders, alerts, special notices, statement etc. To send customized SMS, Log into your account. Click on the "Send Bulk SMS" Tab, type in the GSM numbers of your desired recipient in the recipient Box. Type in the text message , Specify the Sender ID, Ensure you have a good internet connection, then click "SEND BULK SMS". A short summary of the message and estimated cost would be displayed and the message would be sent (provided you have sufficient SMS Unit). You can click on "PURCHASE SMS UNITS" to see how to purchase sms units. When normal mode is chosen, the valid phone numbers separated by comma or newline is expected to be pasted in the recipient box. When Name mode is chosen, you can type in the names of your UFS contact (separate each name by comma or newline), the software retrieves the corresponding numbers for you. When intelicustom SMS mode is selected, you may paste in a tab separated InteliCustomSMS contact into the recipient Box. When typing a text message under inteliCustomSMS mode, the "insert intelicustomsms parameter" panel becomes visible. This panel allows you to insert the column names within the text. As any of the column is selected, the column name surrounded by a [* */] tag is inserted into the body of the text. when the send button is clicked, the tag is replaced with the individual details as is specified in the intelicustomSMS contact. (Please note that under the inteliCustomSMS mode, the count for the SMS may be incorrect as this will depend on the variables for each of the intended recipient). For Example, below is an intelicustom SMS contact and the corresponding message is typed below it. Hi [*First Name*/] [*Last Name*/], your balance is [*Balance*/]. In the example given above the first recipient will recieve "Hi Francis tunde, your balance is 10. the second recipient will recieve "Hi femi bayo, your balance is 2000. Other recipients in the inteliCustomSMS contact will each receive different variation of the text message. If the internet connection is lost while messages are still being sent, the unsent messages are queued up and the status changes to "STATUS: IDLE there is at least 1 queued task". You may toggle between resume/Pause to resume sending of sms once connection is restored. At the " SEND BULK SMS" tab, You can Download or Delete Sent and Unsent SMSes. You can also pause or resume unsent SMSes. In the "settings" Panel, you can make the current sender ID and login Details the default values. You can also specify your own number, (in case you may wish to include it while sending the customized SMS). The Phone Contact Manager tab helps you to import and add contacts into UFS App and also allows you to export existing contacts for Bulk SMS and into other contact formats. With UFS you can import your saved phonebook contacts directly into UFS App for subsequent use in Bulk SMS or exportation to other desired formats. To import contacts from your Nokia and Techno phones, use the proprietary software of the nokia (Nokia PC Suite) and techno phones (Techno Phone Suite) to download or export the numbers as csv or text, then select "Import Nokia CSV" or "Import Techno CSV" from the Import group box. It would prompt you to browse for the saved contact csv file. After selecting it, a preview is displayed, then click save contact to save the contacts to your UFS contact. Most Android and blackberry phone allows you to export contacts on the phone as vcards (i.e, a .vcf format). Transfer the exported vcard to your computer harddisk, then select "import vcard(1 file)" or "import vcard (multi files)". UFS prompts you to locate or browse the vcard of interest. After which it displays a preview for you. Click "save contact" to complete the contact importation process. Saved UFS contacts can be edited, deleted, exported for bulk sms or exported into other formats like nokia csv format, vcard formats or backed up as UFS contact. Saved UFS contacts can be searched using name or number. 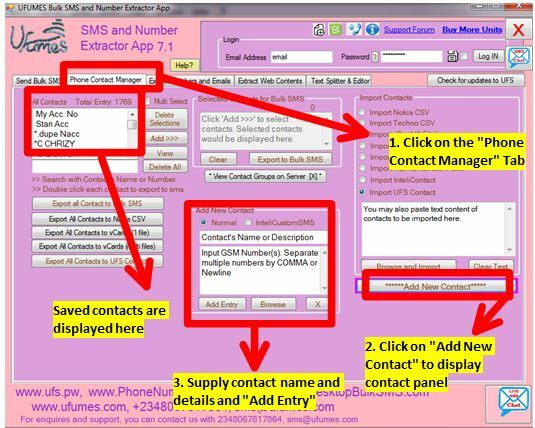 Double clicking any contact exports the contact to bulk sms recipient textbox. How to extract and manage phone numbers from text data files and urls with UFS App. UFS App allows you to extract and manage phone numbers and email address form text files, and web pages. 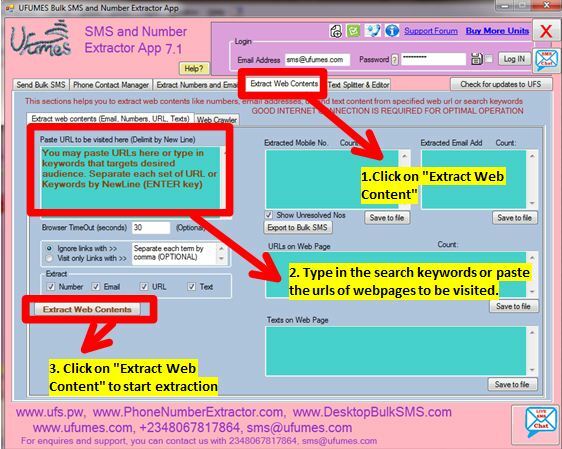 To extract phone numbers form text documents, click on the "Extract numbers and Email" tab of UFS, then paste the text which contains the numbers to be extracted in the textbox provided, click on "Extract Phone Number". Note that extraction credit may be required to complete the number extraction process (for trial versions of UFS). The "Extract Numbers and Emails" tab contains several utilities for extracting and managing your phone number contacts. It can remove duplicate numbers, unwanted numbers, creates groups of numbers, generates numbers, inserts or remove specified country codes, adds users specified separator to numbers, returns only numbers with specified prefixes etc. 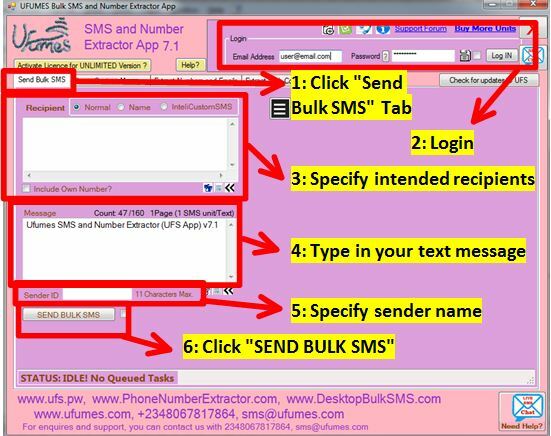 It consists of seven (7) utilities for extracting and managing phone numbers which includes All in 1 Extractor, Number Extractor, Number Generator, Group Numbers, Reformat Numbers, Remove Unwanted No (SUBTRACTOR) and Email Extractor. The phone number extractor logic efficiently extract out, over 99 percent of human readable phone numbers from text data regardless of the format and also allow one to specify custom settings for the numbers to be extracted. In addition to extracting the GSM numbers, it also removes off the special characters like " (,- ,+ etc" and spaces that are often associated with phone numbers thereby returning a cleanly formatted numbers that can readily be exported into any bulk sms application or for other purposes. This sub-tab allows you to extract and reformat, group and manipulate numbers from text data. Paste the text to be extracted in the textbox provided, you may also browse text files directly from your local disk . You may specify the nature of the text data by clicking the "Settings" button. If the numbers has definite separator, you may specify it in the input separator, but if it contains mixed separator, select "Auto Select". If unsure, leave it at "Auto Select" and "Text and Numbers" . You may also specify numbers or prefixes of numbers you wish to remove from the extracted number. You may specify the nature of numbers you wish to extract. If for instance you wish to extract only phone numbers that starts with a prefix of 234,0803, specify it in the box provided, and click extract. Numbers that did not start with 0803 and 234 would be excluded from the extracted numbers. You may also specify other custom settings of the extracted job in the "other display settings" groupbox. In this section, you may add or remove country code using the reformat option, You may also specify the desired character length of the extracted numbers. You may specify the Count per Group(that's if you desire that extracted numbers be grouped into specified number counts). You may also specify your desired separator for each extracted numbers. You may sort, or randomize extracted numbers. Click "Extract Phone Number" after specifying your extraction preferences. This sub-tab allows you to extract numbers from text data. Paste the text to be extracted in the textbox provided, you may browse text files directly from your local disk. The "settings" button allows you to specify the nature of the text data. If the numbers has definite separator, you may specify it in the input separator, but if it contains mixed separator, select "Auto Select". If unsure, leave it at "Auto Select" and "Text and Numbers". You may specify the nature of numbers you wish to extract in the "Desired prefix" groupbox. If for instance you wish to extract only phone numbers that starts with a prefix of 234,0803, specify it in the box provided, and click extract. Numbers that did not start with 0803 and 234 would be excluded from the extracted numbers. You may also specify the desired character length of the extracted numbers and also the desired separator for each extracted numbers. You may sort, or randomize extracted numbers. Click "Extract Numbers" after specifying your extraction preferences. This sub-tab helps you to generate phone numbers that has a desired operator-specific prefixes or country code. You may configure it to generate the phone number of any country as long as you know the starting prefixes and the gsm number has more than 7 digits. Specify the quantity of numbers you want in the Number Count, Specify your desired network operator prefixes. Specify your desired separator. You may select a random generator or sequential generator style. Click "Generate Phone Number" to generate the numbers using your specified preferences. This sub-tab allows you to group phone numbers into specified group counts. Paste the GSM numbers to be grouped in the textbox provided, you may browse text files directly from your local disk. You may specify the nature of the text data by clicking the settings button. If the numbers has definite separator, you may specify it in the input separator, but if it contains mixed separator, select "Auto Select". If unsure, leave it at "Auto Select" and "Text and Numbers". Specify your desired Group Count as well as your desired separator for each extracted numbers. You may sort, or randomize extracted numbers. Click "Group Number" after specifying your grouping preferences. This sub-tab allows you to add, remove or edit the country code or prefix of your GSM number collections. Paste the GSM Numbers to be reformatted in the textbox provided, you may also browse text files directly from your local disk. You may specify the nature of the text data by clicking on the Settings button. If the numbers has definite separator, you may specify it in the input separator, but if it contains mixed separator, select "Auto Select". If unsure, leave it at "Auto Select" and "Text and Numbers". The reformat options allows you to specify your desired reformatting preference. You may also specify your desired separator for each extracted numbers. You may sort, or randomize extracted numbers. Click "Group Number" after specifying your grouping preferences. This sub tab allows you to remove unwanted numbers from your phone number collection. You may remove specific phone numbers or phone numbers that starts with a specified prefixes from the set of number collections. Paste your phone numbers collection in the "Phone number collection" textbox, and paste the unwanted numbers or unwanted number-prefix in the textbox exactly below it. You can specify the input settings by clicking the "settings" button beside each textbox. If the numbers has definite separator, you may specify it in the input separator, but if it contains mixed separator, select "Auto Select". If unsure, leave it at "Auto Select" and "Text and Numbers". The extracted number may either be exported to UFS phonebook contact listings, exported for bulk SMS or saved as a txt file on the local disk. This sub-tab allows one to extract email addresses from a text file or pasted text data. The result is displayed in the lower text box. The output may need additional human review to remove invalid email addresses. Paste the text data in the box provided and Click on "Extract Email"
Using the "Extract Web Content" Tab of UFS App. How to extract emails, urls, texts and phone number from specified urls and search keywords with UFS App. This tab is a semi web crawler that visits the lists of specified urls or searches the search engines for specified search term. It extracts all the numbers, emails,text and url that it finds on the visited web pages. While extracting web contents, the application may experience occasional "freezes". For optimal web content extraction, a good internet connection is required. You may paste your desired search terms or urls in the yellow bounded segment. You need to separate each search terms by a newline (ie pressing the enter key). The specified search terms would be searched using the default search engine of your internet explorer. So if you have a preferred search engine, you will need to manually change the default search engine of your internet explorer so as to be the default way UFS accesses the specified search terms. For a typical web crawling task, paste the first set of urls or keywords in the space provided and click the "Extract Web Content" button. UFS App would extract the emails, gsm and urls it finds on the inputed urls. You may then copy the extracted url and paste again in the url textbox and repeat the extraction of webcontent again. (before repeating the extraction, ensure that you copy out the already extracted web content since it would be deleted by default on the commencement of new web content extraction. You may also wish to edit the urls before continuing with extraction(ie remove some url or selecting only specific url from the extracted urls) , in this case you may need to use the "text editor tab". Using the "Text Data Editor" tab of UFS App. The "Text Data Editor" tab contains miscellaneous functions that helps you to reformat, rearrange and manipulate text data to achieve a wide variety of objectives. Its very handy for reformatting, analyzing or manipulating text and numeric data such as numbers, emails, urls, bioinformatic sequences etc. It allows you to split up the input text data by desired separator or delimeter. It allows you to remove or return only certain elements of the split data that matches specified criteria. It also allows you to split the split data into specified group counts. You may remove blanks and duplicates from splitted data, you may sort, randomize or reverse the order of splitted data. The split data can then be joined up again with desired separator. Select the "Text Data Editor" tab of UFS App. Paste the text data in the textbox provided. Specify your preferences. Then "Click Edit Texts".